If retail experts are correct about 'Mobile POS' taking off, where do you keep the cash? While mobile point-of-sale solutions provide freedom and flexibilty for ringing up sales and taking orders away from the checkout stand, collecting cash and making change still needs to happen from a fixed, secured spot. One of the world's most well known cash drawer manufacturers has developed a networkable, self-contained cash drawer than fills a functional gap when using 'mobile POS' systems. In this note, we examine this offering and describe its advantages and disadvantages for deployment. 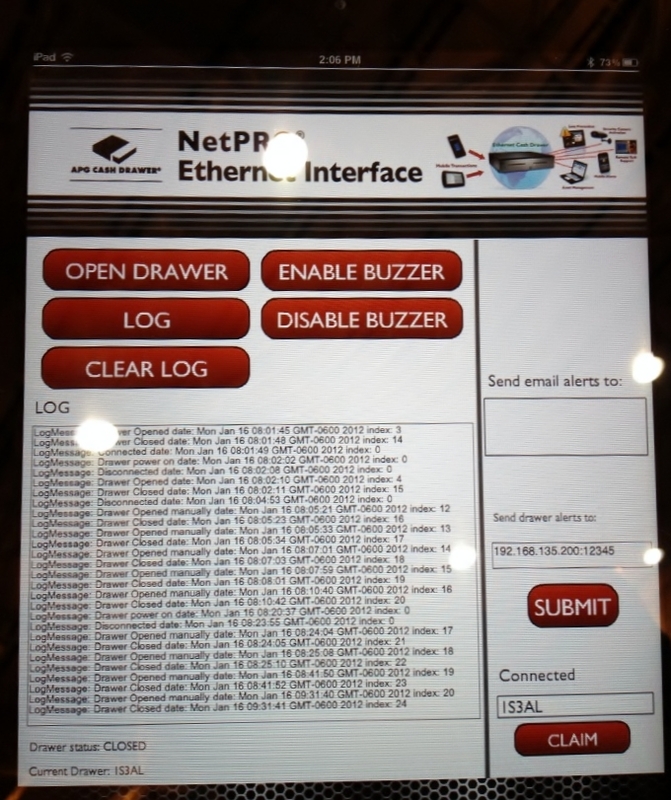 APG Cash Drawer's NetPRO Interface enables a standard sized cash drawer to be placed on the network and given an IP address. Putting the drawer on the network makes it accessable to other networked devices such as computer workstations, tablet computers, and mobile phones. This is an advantage for register terminals that freely float around a sales floor and are not specifically tied to a cash drawer; even if they are not permanently located and hardwired to a drawer, they still have the ability to utilize it. APG offers the network connector component as an option many of their existing SKUs. Price: roughly $250 - $600 USD. Exact pricing varies widely, due to dealer discount model and significant number of drawer part numbers. Giving the drawer a network location eliminates the need for a companion register terminal. This eliminates the cost of terminal workstation. For 'mobile POS' deployments, this means the entire POS system can be decentralized or hosted in the cloud, which is a stated benefit of moving to a mobile-based platform. Small retail operations will find value in buying a 'smart cash drawer' for several hundred dollars rather than a potentially seldom used, full-blown cash register for several thousand. Especially given the increase in pure 'digital transactions' that exchanges no physical currency, the NetPRO drawer provides a simple, more efficent alternative to traditional register systems with ownership costs more in line with the total proportion of cash-only business. While putting the drawer on the network provides use flexibility and audit control, auditing the contents of the drawer or keep track of how much cash is dispensed is still a manual operation. Depending on configuration, the drawer can be remotely opened, but not closed. This could present a security liability; even if the open event is logged, someone could steal the drawer contents.